The Hoos brought home the national championship Monday night and thousands of University of Virginia students, alumni, parents, employees and fans converged in Minneapolis, each with their own story to tell. There is, of course, THE story. The story written by Cavalier head coach Tony Bennett and his basketball team as they worked their way back from a tough loss last year, put together an ACC-best regular season, fought their way to the Final Four and ultimately won the program’s first national championship – all with grace, poise and a clear love and respect for each other and the University they represent. That story alone could fill many books – and many Hoos would read them all. But there are other stories too. Stories of students who piled into cars and drove across the country to witness history – some of them first-years just beginning to grow close with their classmates, others fourth-years who are treasuring these last few months on Grounds with their UVA friends. There are stories of parents, some in the stands cheering on their sons on Bennett’s team; others bringing their young children to the game, inspiring dreams of the future. And there are stories of alumni and UVA employees, relishing this victory for a university that they have invested many years in – not to mention many stressful overtime moments. All of them, in their own way, have been inspired by what this team has done and how they have done it. Hear from just a few fans who were on hand in Minneapolis to watch the storybook ending come together. 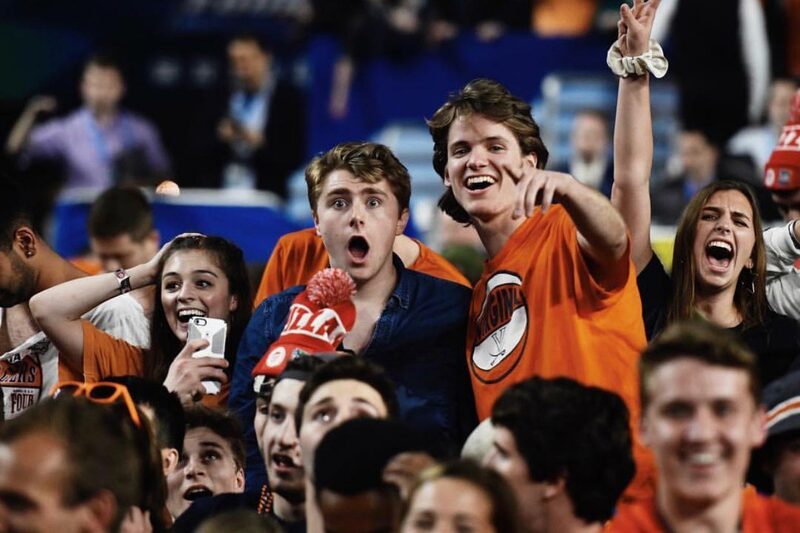 Three days before the national championship game, first-year students Avery Shivers, Kyle Thielsch and Shannon Foster packed up a car to go cheer on their Hoos in the NCAA Tournament Final Four. Shivers, who grew up in eastern Virginia, has been a UVA hoops fan for as long as he can remember. Thielsch got the bug when his brother, four years his senior, decided to attend UVA. Foster didn’t start following the Hoos until she enrolled in the fall, but she quickly became a fan – and converted her family. The trio knew they couldn’t miss the Final Four, the long trek notwithstanding. All told, it took them 18 hours to cover the more than 1,100 miles between Charlottesville and Minneapolis. They arrived Saturday morning, just in time to get ready for the Hoos’ 6 p.m. semifinal date with Auburn University. Amid the essentials they packed were a pair of bright orange-and-blue-striped overalls, borrowed from a friend who could not make the trip. 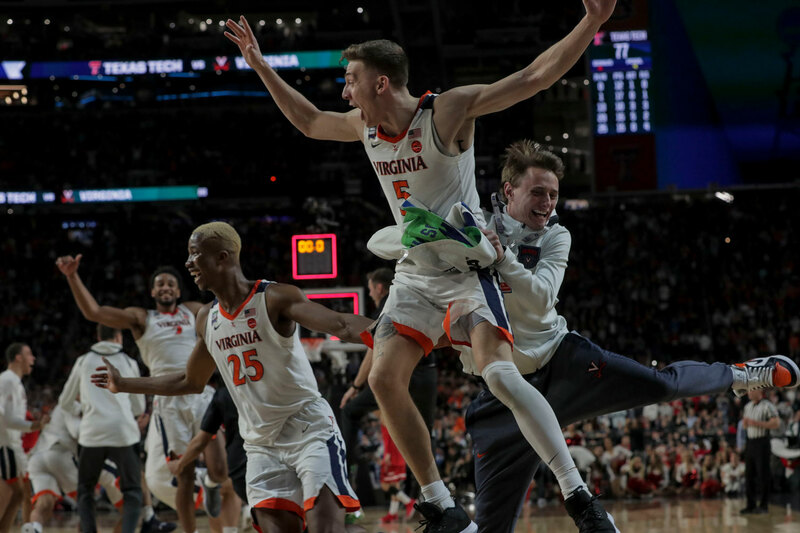 Thielsch donned the dramatic duds for what would turn out to be a dramatic Final Four finish, from Kyle Guy’s clutch, last-second free throws against Auburn to the overtime national championship win. “For a second, we thought we lost, and we were heartbroken,” Thielsch said, wearing a blue shirt over those same (now lucky) overalls Monday. 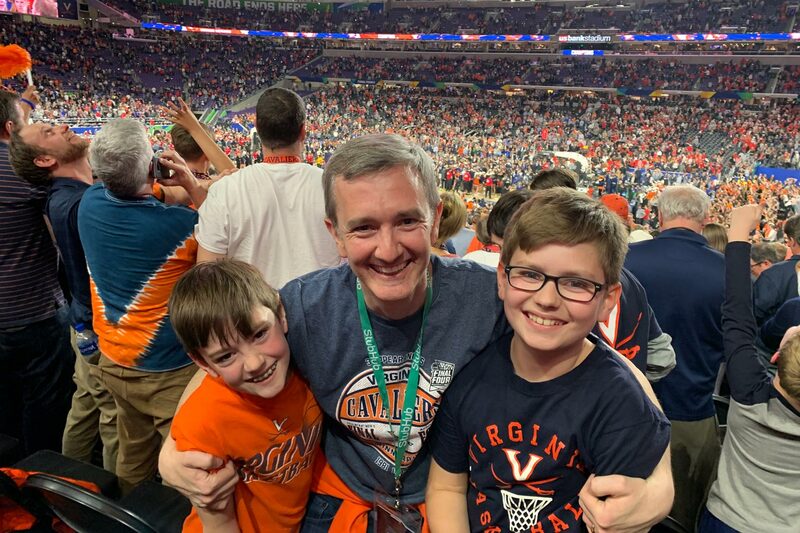 He recounted the last few seconds of Saturday’s Final Four game, when Guy was fouled and swished three free throws to put the Hoos up by one point with time expiring, setting off a frenzied celebration in the student section, U.S. Bank Stadium and among Hoos watching worldwide. The student section, Shivers said, was amazing. UVA students arrived three or four hours before each game’s tipoff, just to get a chance to stand on the front row. Once the game started, they led the crowd in many of the same chants that fill John Paul Jones Arena during the regular season, from choruses of “U-V-A! U-V-A!” to spontaneous “To-ny Ben-nett” cheers. “It’s just been a great time,” Shivers said. The students erupted again in the final seconds of regulation on Monday, as De’Andre Hunter hit the 3-pointer that would tie the game and send the national championship into overtime. “During overtime, we were all incredibly stressed, but once we started making free throws, the student section started getting really hype,” Thielsch said. “I can easily say it was a blessing to be there. … It has been (and most likely will always be) my favorite UVA sports moment.” Asked what they liked most about this year’s team, the three students quickly referred to what would become a common theme of the weekend: resilience. Thielsch himself was proof that the grace with which the team handled that defeat – from Coach Tony Bennett to the players to the staff – made an impression on the larger student body, and on younger students like Thielsch. He still remembers something Kyle Guy said about it. 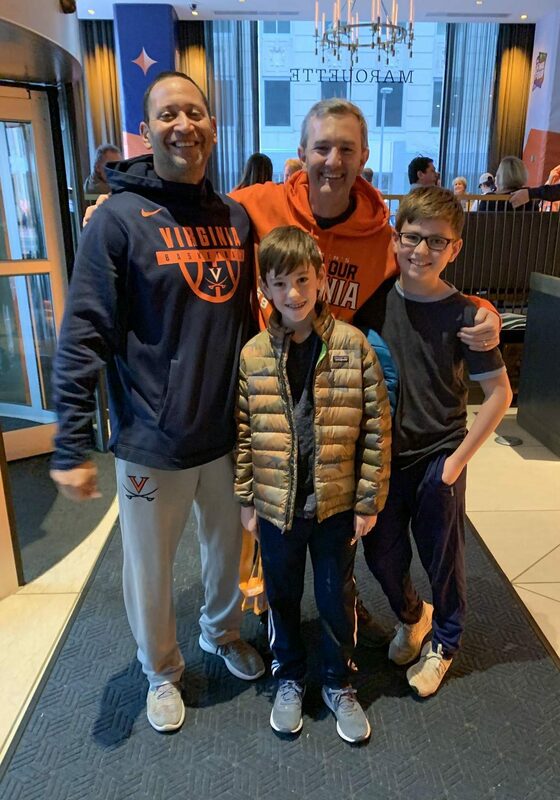 A few feet away from Thielsch and his friends, behind the CBS set in the atrium of the team’s hotel Monday, alumnus Chris Duffy stood with his two young sons, James and Henry. Duffy, who now lives in New York City, graduated from the University in 1994. He became a basketball fan as a student and has cheered the team on ever since. This was the family’s first Final Four, and it meant a little bit more because of their personal connection with one of the UVA players: third-year point guard Ty Jerome, who was named to the All-Tournament team and had 16 points and eight assists in Monday’s win. Jerome is from New Rochelle, New York, near where Duffy lives, and his father, Mark Jerome, coaches James and Henry’s youth basketball team. Perhaps unsurprisingly, the elder Jerome is a “fantastic” coach, according to Duffy. In fact, they had just run into him in the atrium, as Jerome was waiting to be interviewed by CBS, and were eagerly awaiting their coach’s appearance on the TV stage. Sharing the weekend with them, and watching Jerome and his teammates win not just the Final Four, but the whole championship, was a chance of a lifetime. Duffy later recounted the moment with gusto. After Monday night’s win, Robert Bishop and Kelly Branch could not even think about going to bed – there was too much to talk about, too many memories to relive. And besides, they had to leave for a 4:45 a.m. flight, just hours after the game and subsequent trophy ceremony ended around midnight. Bishop and Branch both live in Charlottesville and work in facilities management and maintenance for UVA’s Health System. They are big UVA basketball fans, and figured coming to the championship game was the least they could do. After all, they had been present in 2015 in Omaha, Nebraska, when UVA’s baseball team won its first national championship. They had made a last-minute decision to go to Omaha, leaving at midnight and driving through the night to reach the game. With them in the stands, the Hoos won, defeating Vanderbilt University. “We figured we might be good luck,” Branch joked. And so they made the trek to this national title. And if their two-for-two national championship record is any indication, they are indeed good luck. Like Thielsch, the first-year student, and his friends, Bishop said last year’s loss made this year’s victory particularly sweet, and the players’ attitude particularly inspiring. A few seats down from Bishop and Branch, alumnus Scott Andrews was celebrating with his family and reflecting on all Bennett and his team had taught the University community – and the wider sports world – through their extraordinary championship run. Andrews graduated from UVA in 1980, and his younger daughter just graduated in 2018. He was relishing the fun of the tournament, rehashing some of the game’s best moments with his wife and older daughter, and exchanging hugs and handshakes with friends and fellow alumni as they walked by, complete with hearty “Go Hoos!” cheers. The alum clearly had a goofy side as well, having dyed his hair bright blonde to match third-year forward Mamadi Diakite’s much-talked about ’do – a reference that sparked a lot of laughs and high fives in the hotel lobby. His reflections on the game, however, were more serious. What he witnessed – especially in the moment the long-awaited final buzzer sounded and Bennett’s team stormed the court, joy written all over their faces – was about much more than basketball. Everyone, he said, can learn something from this particular story.